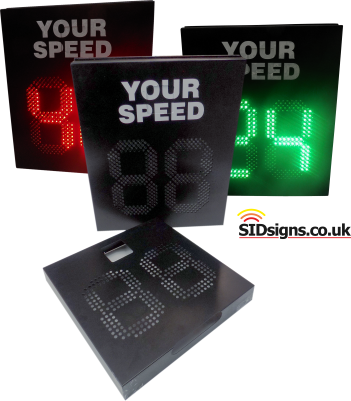 ﻿ Bi Colour speed displays, colour change radar signs. Ideal for smaller sized signs. Bi colour speed displays flip between two speed matrices, one for under speed traffic, the other for over speed traffic. Changing the colour of the display depending on how fast vehicles are travelling allows you to do away with additional SLOW DOWN messages and other led graphics such as faces or thumbs. In most cases the first speed matrix is built using Green led's. When an approaching vehicles is detected as being under the set speed limit the speed of this vehicle will be displayed in Green lights, easy to see, easy to understand. If an approaching vehicle is detected traveling faster than the set speed limit the Red led matrix is used. You see a clear indication of vehicle speed displayed in bold Red lights. Easy to see, easy to understand. Internal software settings allow you to tell the bi colour sign display when to switch on the Green lights when to flip from Green lights to Red, when to turn off the Red lights If you want you can set the Red lights to flash, reinforcing the message that the vehicle is speeding. The big advantage of the bi colour speed display format is space saving. Many customers want something fairly small and easy to handle. With a bi colour speed display there is no need to allow space for SLOW DOWN messages, coloured faces or other attractive but space consuming graphics. This means the sign face can be kept as small as possible, it means the casework can be paired down to the smallest size possible. The bi colour display nests one set of led lights inside the other. Typically the Red lights used for over speed warning are on the outside of the matrix, the Green lights used for under speed display are on the inside. Fitting one matrix inside the other allows you to save space keeping the sign as small as possible. Some bi colour speed display customers like the Green & Red lighting other prefer a Yellow & Red lighting format. Because your bi colour display is manufactured from two different sets of led's we can use any colour combination you prefer; all you have to do is tell us what you need. Bi colour speed displays share the same software & power platforms used on other formats. From auto-detect USB setting updates to data collection the way in which you set and use the display is universal. Sealed Lead Acid, Lithium Ion or mains; all power options are available; it's simply a case of pairing your bi colour speed display with the power pack which suits your needs best.